On these pages we will feature an ever-changing selection of the original productions that Green Ginger has created and toured around the world since the company was founded by Terry Lee in 1978. If you’re drunk on power can you ever sober up? Two guards are stationed at a border between Escobia and Grud. Luis believes in order and discipline, whilst BK believes in taking things easy. He also believes that somewhere out there, the spirit of a mysterious creature haunts the desert. The chance discovery of a strange other-world takes the guards on a journey into the dark heart of politics, tyranny and murder. 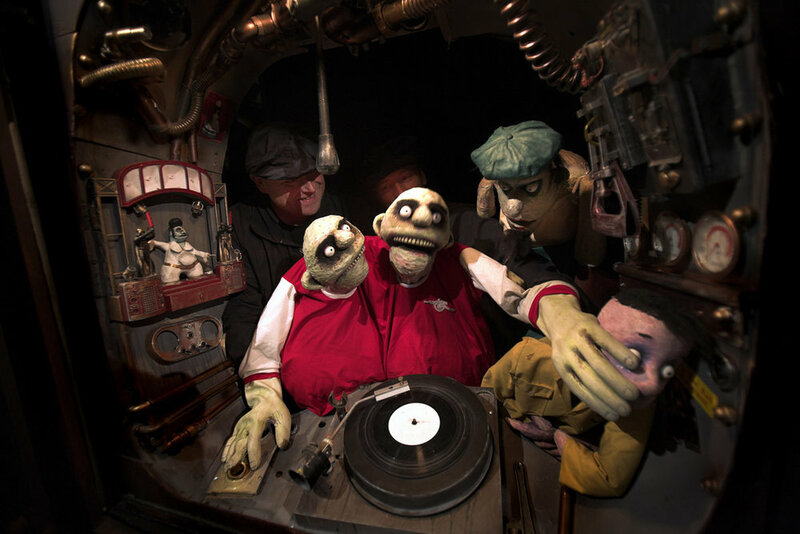 Absurd comedy and grotesque puppetry combined with original music in an hour-long show that explored nationalism, power and the consequences of using another man’s toilet. Two pirate radio stations are anchored in the same murky coastal waters. One transmits from a lightship; its arch-rival broadcasts from a submarine lurking just beneath the oil-slicked surface. Something has to give…or be taken. RUST was a fast-moving story of piracy, passion and vinyl. Grotesque puppets, animated sets and shiploads of absurd humour were welded into a dark comic-book vision of low-life on the high seas. The show toured to great acclaim in Spain, France, Portugal, Sweden, Norway, Poland, Denmark, Switzerland, Netherlands, Belgium and Germany. Whatever happened to that creature with the big watery eyes? The Bambi story comes of age in a comic-book nightmare set in a beastly urban jungle. Green Ginger, with its customary disrespect for classic tales, used masked performers, grotesque puppets, animated sets and projections to shed new darkness on a bittersweet story.